We all know how easily our homes get a blocked sink or toilet and we’re all familiar with the trouble it can cause if the problem persists. Fortunately, if the blockage isn’t too severe, it can be fairly straightforward to fix and you may even be able to do it yourself. Pour 1-2 Kettles of boiling water down the blocked sink or toilet and grab a plunger in the hope of loosening the blockage, just as you would approach a blocked drain. This could turn into a dirty job so it’s advisable to find yourself a pair of gloves before getting stuck in. If you’re lucky this should do the trick and fix the blockage. When you’re totally convinced that this has done the job, flush the sink or toilet once again to check that everything is operating as it should be. The first thing to do is to clear out your plughole as thoroughly as possible. Though this may not be the source of your blockage, this will make life easier when it comes to flushing the sink through. The best solution to use is a simple mix of baking soda and vinegar. Pour the baking soda in first, followed by the vinegar. You should hear a slight fizz as the solution does its work. Wait a short time and then flush through with warm water. If you are able to, leave it to work overnight before running the tap in the morning. Avoid using harsh chemical drain unblocking solutions such as caustic soda as these can burn skin on contact and may leave a hazardous residue around your sink for hours after use. If your blockage is a bit more severe, you will need to drain the sink and examine the U bend. Take a look beneath the sink and locate the first bend in the pipe which falls down from the plug hole. Place a washing-up bowl or similar receptacle below the bend and slowly unscrew the U bend, allowing the water to drain at a steady pace. When the water has drained completely, take the U bend and clean it thoroughly. You may like to use a hooked coat hanger to drag out anything which is lodged deep into the tube. If you are struggling with your blocked sink or toilet, then give us a call. We will be happy to have a look and help you to solve the problem. 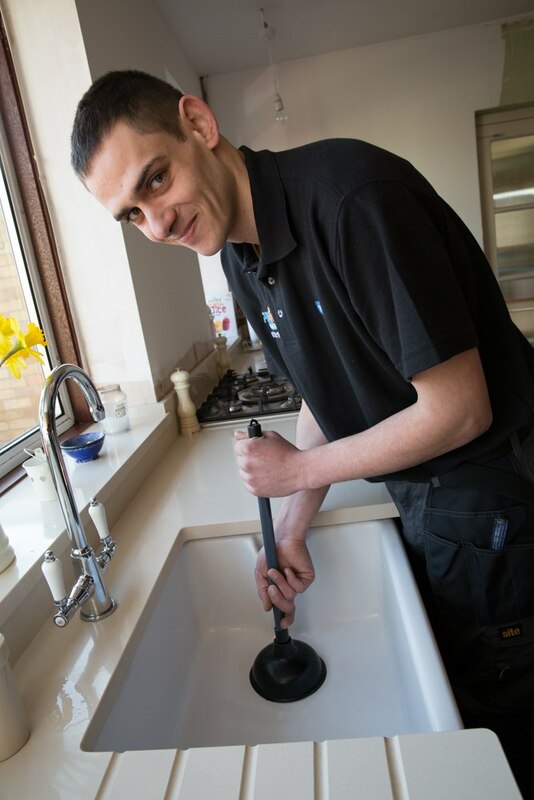 We can also help you to thoroughly clean your drains, making future blockages less likely.